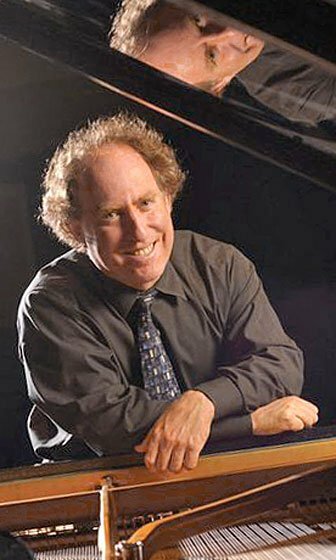 It was a curious selection of works to gather on one program, but the NEC Philharmonia with Jeffrey Kahane as conductor and pianist played with great energy and accomplishment. Mozart, Lutosławski, and Barber were on offer Wednesday at Jordan Hall. The concert began with Mozart’s Concerto for Piano No. 22 in E-flat, K. 482, with Jeffrey Kahane conducting from the keyboard. For this performance, the lidless modern grand piano was placed center stage. Kahane sat with his back to the audience and a chamber orchestra drawn from the ensemble surrounded the piano. Persons I took to be piano students sat at either side of the hall, perpendicular to the stage, to watch him perform. So the visuals were not ideal, but the sound was fine and he clearly interacted with the musicians using facial expressions as well as gestures. There was tight unity between the piano and orchestra, with coherence of ensemble throughout. The performance clearly represented Kahane’s reading of this work; I have a different aesthetic for this music, so I was less taken by this performance than others might have been. I found the music heavy in the Allegro, with only fleeting intimations of lightness during a snippet of the piano’s cadenza. The Andante opened with a degree of seriousness that put me in mind of Barber’s Adagio. The Rondo: Allegro finale seemed to re-start with each return of the theme — a nice joke, but one undercut, for me, by the ponderousness of the previous movements. I am not denying weight or seriousness in Mozart’s music, nor do I want it all to sound like light fluff. But even at his most probingly serious, Mozart retains a crystalline clarity of compositional form and harmony and a sonic lightness. That is what I missed in this performance. Though Kahane’s lush and dense Mozart did precede the Barber on this concert, I just don’t find that sufficient justification for his interpretation. Again, it was well-executed and coherently performed throughout; kudos to all the musicians for committing whole-heartedly to this performance. I just wish the interpretation had been different. Following intermission, the full complement of the NEC Philharmonia returned with Kahane on the podium for Witold Lutosławski’s Symphony No. 4. This late work from the final, mature phase of the 20th-century Polish composer’s life was premièred 1993 by the Los Angeles Philharmonic, with composer conducting. In one movement lasting some 20-odd minutes, the work combines composed and precisely structured music with improvisatory sections (the music notated, but the rhythms free and varied among the players). The symphony has a twofold character, mixing lyricism with mercurial passages of velocity and loud attack. The whole begins with a low grumble on violoncello and bass, before turning to a singing melody on clarinet, later joined by flute. The mercurial side ranged from mewling to skittering to incisively pounding, by turns, with some of the rhythmic pulses recalling music of Shostakovich. The piece reaches its apex with combined brass and strings in a version of a chorale, before a softer coda concludes the work. This symphony is amazingly versatile and innovative in its orchestration, full of unusual colors and timbres. It was a treat to hear this live, and lively, performance of Lutosławski’s music. The third and final work on this program was Samuel Barber’s Symphony No. 1, op. 9. Composed and premièred in 1936 (then revised 1942 –3), this symphony runs about 20-minutes. Like classical models this work has four contrasting sections, but it follows the example of Sibelius’s Symphony No. 7 in combining those into one movement. In this early composition, Barber already displays his distinctive American neo-romanticism that is lush and lyrical, captivating and compelling. The opening Allegro ma non troppo contains three contrasting themes which serve to structure and unite the work. The Allegro molto (vivace) presents a diminution of the first theme as a scherzo; the Andante tranquillo third section presents an augmentation and expansion of the second theme. The whole ends in a final Con moto: Passacaille, combining the three themes and bringing the symphony to a close. The trademark rich harmonies of Barber are here paired with a Jazz Age fleetness, most obviously in a chattering fugato section which races forward in time as the sections of the orchestra chase one another. The composition is assured and poised; fittingly, so was the playing. I overheard a patron seated behind me saying to his companion, “I wonder why the Mozart was on the program?” He is not alone in asking that question. After intermission Jeffrey Kahane announced the second half of the concert as two composers’ attempts to answer the question, “How does one write a symphony in the 20th-century?” Lutosławski and Barber are not alone in answering this question, of course, but in these works they both offer an answer prioritizing brevity and compression mingled with innovation and a wealth of audible influences. There were no program notes; the details in this review come from my own research, but more importantly we have no statement about the program as a whole. Sadly we are all left with the unanswered question: why was the Mozart on the program? To hear a recording of this concert click here. Well, of course the concerto was on the program so that Mr. Kahane could demonstrate that he’s a great pianist. I’m going to agree with the reviewer, that the concerto performance really didn’t work. I’m not sure “heavy” is quite the right description. “Lifeless” might be closer. I’m not sure the rest of the concert was much better. The music of the second half fit better into a ponderous, over serious approach.